In this paper, the TiB2-reinforced Al–7Si–Cu–Mg composites manufactured by casting and arc addition were studied. TiB2 particles were nano-sized or submicron-sized and their morphologies were regular and round, thus they improved the mechanical properties of aluminum-based composite. Two different processes were compared in the microstructure and properties of aluminum-based composite. 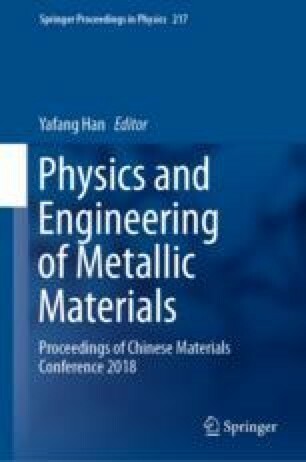 Through the contrast of SEM and EDS analysis, it was found that the distribution of alloying elements in the wire arc additive manufacturing (WAAM) TiB2-reinforced Al–Si-based composites was more dispersed, which reinforced the solid solubility. The size of TiB2 particles decreased and the distribution was more uniform. The hardness increased to 86.2HV10 as compared with as-cast state. The silicon phase of the as-cast sample was large and distributed continuously along the grain boundary, while the silicon phase in the as-deposited microstructure was dispersed and its size reduced to 2 µm. The heat treatment of WAAM Al–Si composites was carried out, and two sets of heat treatment mechanisms, aging and solution post-aging, were compared. The hardness of the material rose to 127HV10 after single aging, and it was improved to 139HV10 under solid solution post-aging condition. The reinforced Al–Si-based composites were found to achieve a supersaturated solution state through WAAM.